There appears to be an air of finality surrounding some of the analysis of Munster’s Heineken Cup exit in France on Sunday. It started with the Sky Sports coverage of the match in the Mediterranean port of Toulon. More than once, the Sky cameras highlighted the sun setting on the harbor and the commentator stressed the significance of the image. Munster’s exit at the pool stages of the Heineken Cup -- and with a game still to come at home to London Irish on Saturday -- means this is the first occasion they haven’t been in the quarterfinals since 1998. The renowned George Hook was first with the obituaries, but at least he had a sense of humor about it. Others weren’t quite so circumspect, with more than one pundit saying that this current Munster team has reached its sell-by date despite their two European Cup wins to date. Sadly, they may have a point. The Munster scrum has been creaking all season and finally paid the price in France. Their great players have grown old together, and their discipline wasn’t what it should be in Toulon when both Ronan O’Gara and Donncha O’Callaghan were sin-binned. There’s a lack of young players coming through, compared to Heineken Cup contenders Leinster for example, and there are serious questions being asked of coach Tony McGahan. All of which makes for pretty depressing reading if you’re from one of the counties who support the Reds through thick and thin -- but only if you take the pundits seriously. Those of real southern stock will know that Munster players and Munster fans pay no attention whatsoever to anything that’s said about them or written about them. That’s always been their way and it won’t change now, so you know where to stick the Munster obituaries -- where the Toulon sun don’t shine. If they beat London Irish on Saturday, McGahan’s men can book a place in the last eight of the Amlin Cup, Europe’s second main club competition. 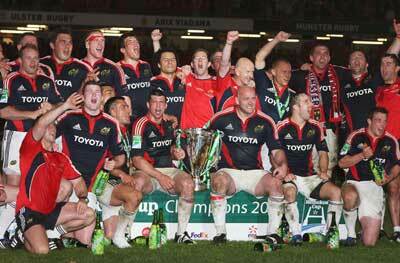 That won’t compare with the quarterfinals of the flagship Heineken Cup, but it would help to ease the pain. And it might just shut a few people up into the bargain.